Send anchored messages and create discussion threads. Or simply chat. Select content (including equations) and style it as a message. Select the draft message, set a response time, and send it to your collaborator. The collaborator receives a notification in AuthorCafe and an email. Once someone responds to a message, it becomes a discussion thread to which you can add any collaborator. We call this content-centric Inline Messaging. For general conversations, use Chat. 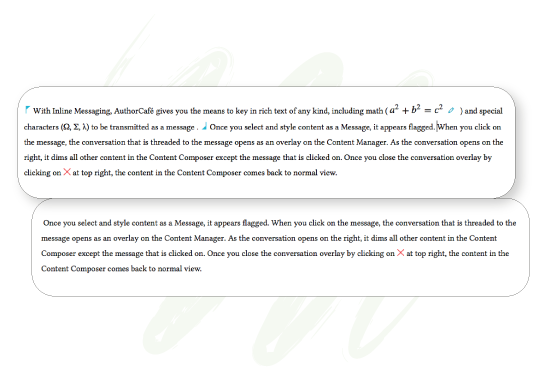 Inline Messaging is an exclusive AuthorCafe feature that makes it easy to send any content (even math) as a message. This provides a practical and efficient way for collaborators to discuss specific project points without the hassle of sending emails back and forth. When recipients click on the link, they are taken to the specific discussion point. An Inline Message is another way to invite a collaborator. 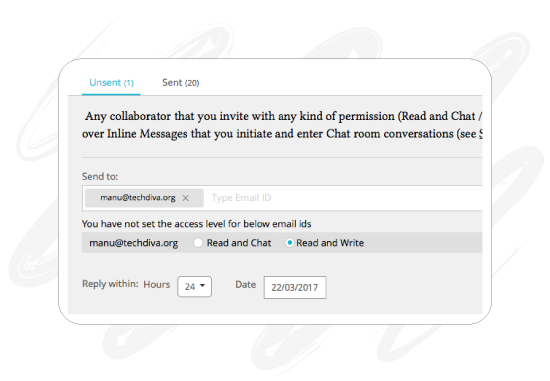 As you invite, you can assign user permissions as Read and Write or Read and Chat. 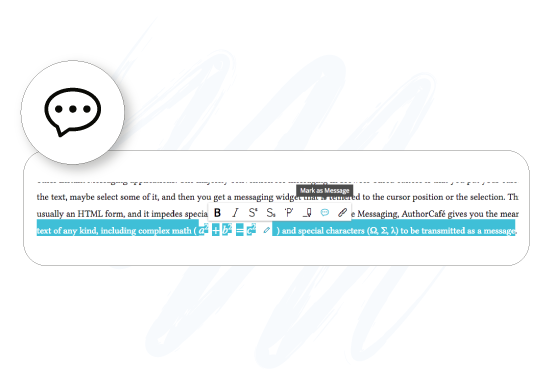 Collaborators who have permission to write can create their own Inline Messages. 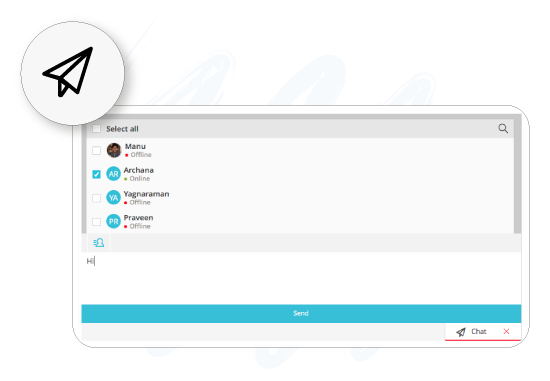 If you set a Read and Chat permission, the recipient can reply to the message and join the conversation thread. You can also set deadlines to respond to your message. This is helpful for collaborators working in different time zones. Inline Messages are automatically hidden when you launch your project in the AuthorCafe Reader. They are also removed when you export your project as a docx, pdf or other format. Not all communication needs to be about a specific point in your content. AuthorCafe has a chat function for general conversations not directly about the content. You can save a transcript of your chats for future reference.